Dava Sobels Longitude reads like a very good New Yorker article — a dramatic, well written, human story about a arcane topic that is intrinsically interesting. 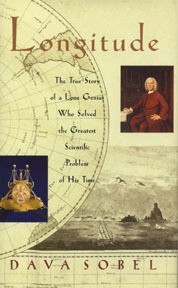 It is the story of a largely-forgotten genius, John Harrison, and his brilliant solution to the thorniest scientific problem of the eighteenth century. Known as the longitude problem, it was the inability of ships to know where they are when out of sight of land. Estimating latitude (where you are on a line from the Equator to the North Pole) was easy, but no one had a clue about how to estimate a ships longitude (its position on the circle that its latitude inscribes on the globe). A prize worth more than $12 million in todays dollars was offered by the British government for a solution. The scientific establishment sought a solution in astronomy, mapping the relative movements of the heavens as a way to tell time objectively and so determine relative position. Harrison dared to imagine a mechanical solution — a clock he called a marine chronometer that would be so precise that you could compare sunset with what you would see at that time in England, and so know just how far East or West of England you are. Over 40 obsessive years Harrison struggled to build a prefect chronometer, and to get it recognized by a skeptical scientific establishment. Its a great story, well told.